I often get asked to promote certain brands or products, and sometimes I'm dubious about the jobs as I only ever want to push things I truly like and want my fans to like too. Pams Superfood Range isn't one of those examples. I just got sent a hamper brimming with bags of ingredients from their new Superfoods Range, and I'm genuinely excited to bake with them! In particular, the Ground LSA, Coconut Flour, Raw Cacao Powder and Goji Berries inspired me to adapt a recipe from my book so I could share the love with you all. It's a super easy recipe, which is unbelievably rich and decadent while not being overly sweet. It has a luxuriously velvety crumb which is enhanced by the texture of the coconut. 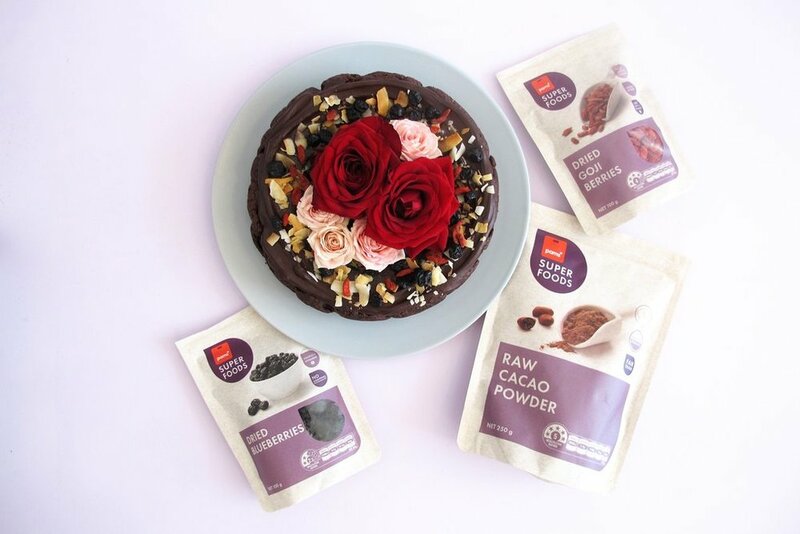 And you needn't feel guilty about indulging in this cake because, with the addition of so many superfoods ingredients, this cake is better for both the tastebuds and the body. Preheat the oven to 170ºC. Line a 22cm cake tin with baking paper. In the bowl of an electric mixer combine all of the dry ingredients. Mix in the coconut milk, rice bran oil and chocolate chips, being careful not to over mix. Pour the batter into the cake tin, spreading out to the sides. Bake for approximately 40 minutes or until springy to the touch and a skewer inserted in the centre comes out clean. Meanwhile, make the ganache. Heat the coconut milk in a small saucepan until bubbles start to appear on the surface. Take off the heat and stir through the chocolate with a whisk until it is fully melted. Continue by whisking in the Olivani until the ganache is thick and glossy. Once the cake is completely cool, apply a neat layer of ganache onto the cake. Decorate with toasted coconut flakes, dried blueberries, goji berries and fresh flowers. Store in a cool, dry place in an airtight container for up to 3 days.